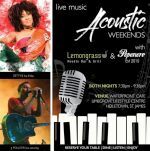 You are invited to Acoustic Weekend Vol. 2 at Limegrove. Enjoy some of the best local acts while you dine at Lemongrass or Pepenero, next to the waterfall and fountain at the Waterfront Cafe in the Limegrove Lifestyle Centre. On Friday, enjoy the music of Betty B, with JJ Poulter performing on Saturday.